That explains why you want to keep Caldwell around. Let go. I will never understand why people let commercials bother them, who cares? Furthermore, who watches commercials anyway? I either change the channel during a commercial or find something else to do. The only time I watch commercials is during the Superbowl but otherwise, it's just background noise to me. my mute button asks. "What's a commercial?" I envy those who have the time to mute commercials! Commercials are for getting a new beer. Bit of off topic... was in Sydney, AU all last week (work). Watched a total of 7 NRL games, including 2 back-to-back (it's surprisingly addictive). Many were pre-recorded, but in Australia there's *always* a rugby game on TV. Non. Stop. Action. Some pretty frightful collisions. Saw two guys knocked out in one game – one from a hard knee square on the temple. I honestly thought the dude was dead. 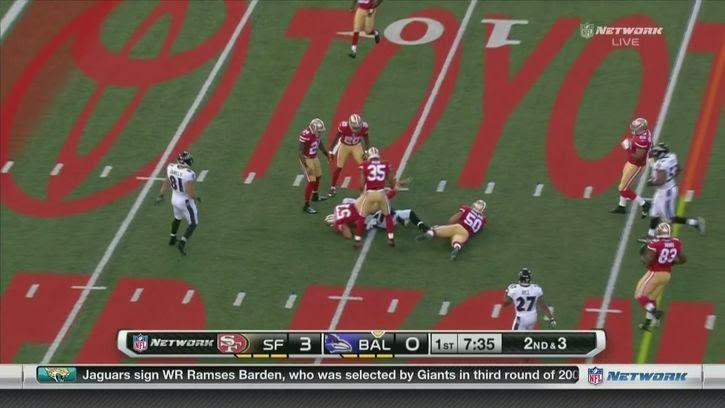 And they leave these guys laying on the field – they don't stop play. Both players were back on the field after a short sideline rest. No concussion protocol. The only commercial break? Halftime. Other than that, commercial free from start to end. Commercials don't really bother me at all. What bothers me is the ridiculous rule book. Not a play happens where you don't wait for the flag, they can't agree on what a catch is, & replay is excruciating. all american sports are very slow. especially baseball. Baseball: 3 minutes of action crammed into 3 hours of play. I think things really might start evolving in the near future re: Commercials. We're already starting to see if with commercials in split screens during non-action parts of the game. I'm sure these are coming in because more and more people are DVRing and skipping through the commercials. Broadcasters are trying to find more ways to get in the ad revenue. I suspect it won't be too much longer until ads appear on the players jerseys. I think we'll also start to see adds digitally added to the field of play off to the sides. Kinda like the ads at at Hockey Rink, but obviously there's no walls to put the ads on so they'll be digitally imposed on the field. I expect to also see more "score board" ads as part of the score/clock banner shown on screen. As long as the ads aren't too intrusive, I don't have a problem with them. Ads are largely how the league is paid for so it's a necessary evil, and I'd rather have some un-intrusive ads in the game than even more stoppage of play during the game. It's a little annoying, but it's not terrible, and if they turn it off as soon as the ball it hiked It wouldn't be awful. 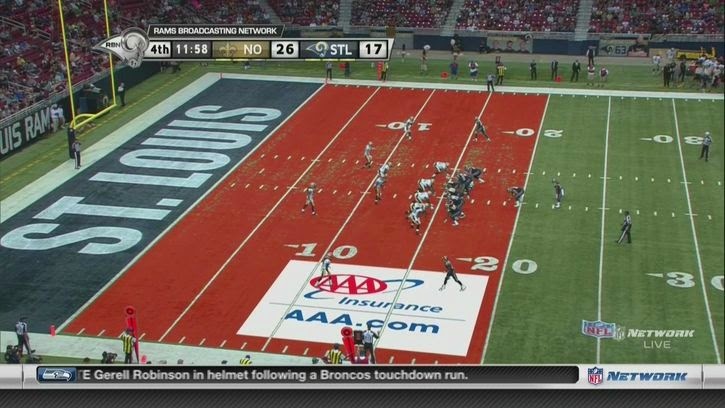 (Not sure if this was live game or just a replay on NFL network. First, unlike the above picture, the ad it across the whole field. Plus, it's completely "un-uniform" with red here and there and green field the rest of the area causing it to just look a confusing mess. 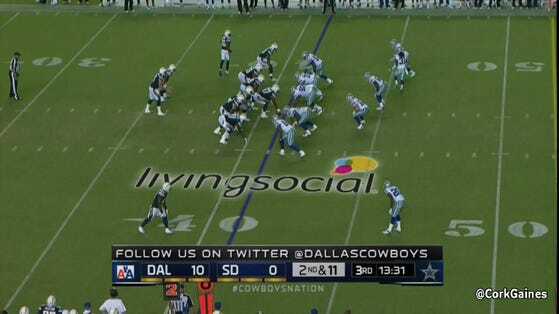 Second, it obviously wasn't removed when the ball was hiked meaning you saw this during the play. Here's another I couldn't have a problem with... heck, this one might even be okay during the play as it's small, and relatively out of the way. Looks like probably another preseason game. Notice also the America Airlines logo in the score/clock bar at the bottom. I would expect them to be team level, that way by passing the "distraction" angle... if everyone on the team has the same ad, then it just looks like another part of the uniform. "Browns leaving a bad taste in your mouth? Try Orbit Gum!" "Why are they called the Browns if Orange if their primary color? If you too are suffering from vision problems, come see us at the Cleveland Optimists!" "Your business would probably fail too without a logo. We're the Ohio associate of Graphic Designs. Come see what we can do for you!" "Sick of brown crap ruining your day? Call us to clean your septic tank!" "Browns just can't get it done... that's why you should use FedEx instead of the other guy!"